We provide some of the most tasteful kitchen remodels to homeowners throughout the Ocean County area. We stand apart from other home improvement contractors because we listen and work with you every step of the way. Our master craftsmen are trained to develop your ideas into a room your family will love for life. From the color scheme, which can range from appetite stimulating to cool and sedate, throughout the entire concept phase, we will help you come up with the plan for your new kitchen. Our goal always has been to make it as eye-pleasing as it is functional after remodeling, and the plan helps ensure it. Whether you decide to keep your appliances or purchase new ones, we design for your particular situation. Let Stanley Contracting do the heavy lifting as appliances need to be moved and/or replaced. We will happily dispose of your old appliances for you. 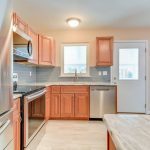 From our wood shop on Route 530 in Whiting, we bring out some of the finest kitchen cabinetry this side of PA. From simplistic shaker cabinets to more intricate designs, our carpenters can bring your vision to life. We can also build and install cabinetry available from our suppliers or local home improvement stores. Your remodeled kitchen will be very “user-friendly” and look great to boot. Have you considered granite for your kitchen? It really is the ultimate working surface for any cook. Granite counters in your kitchen make cleanup a breeze, and provide an everlasting appeal that can only come from natural stone. Available from our suppliers in Ocean County, we can help you select a stone that will compliment the theme of your new kitchen.